For a while now I felt like I have ran out of inspiration in the kitchen. I mean, it has been chicken and potatoes for quite some time, and I started missing the challenge and the new in dinners. The best thing to do in such a situation for me is to buy a new cook book. And of course, what better way to refresh my love for cooking if not through Gordon Ramsay’s most recent, Ultimate Home Cooking? While I hate watching the TV show because of all the forced camera happiness in the Ramsay family, the recipes are naturally mouth-watering. I’ve also had a serious vegetable craving for the past few weeks (I mean I am constantly munching on cherry tomatoes!). And since my boyfriend, who is probably the most anti-vegetable person I know, is working late this week, I decided to go with this delicious mix of vegetables and halloumi to catch up on my crunchies. Put the grated courgette and carrots into a colander, season with salt generously and let drip for a while. The salt helps to get rid of the liquid – which you will definitely definitely need. Try and squeeze out all the liquid to make your patties stick together more. Put your vegetables into a bowl. Add your grated cheese, shredded coriander and season well with pepper (don’t add too much salt as the cheese is very savoury anyway). Note: Gordon also uses some fresh mint in this recipe, but I’m not a fan. Add your eggs and mix well; finally, add the two tablespoons of breadcrumbs and mix again. The mix should now form into patties easily (squeeze out the remaining liquid whilst you do that). Place them on a plate and cool for 20 minutes until they firm up a bit. 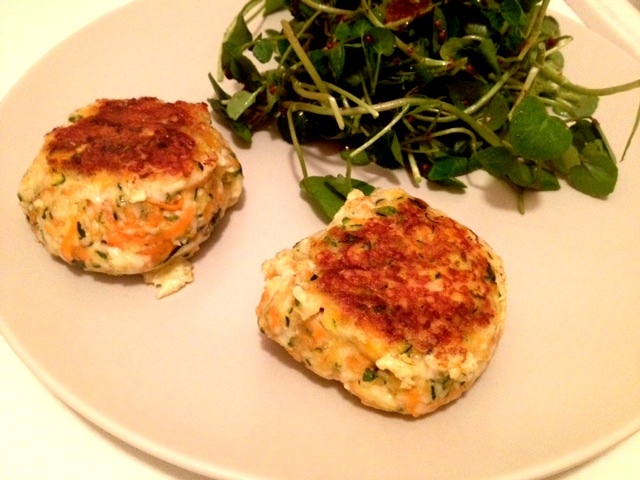 Shallow-fry the patties until the two sides are lightly browned and they are warm thoughout… and you are ready to serve! 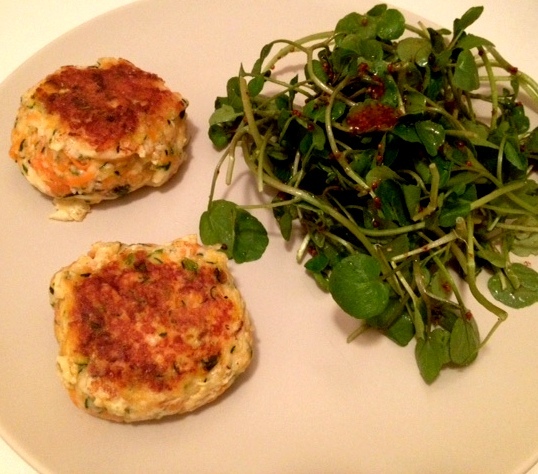 I had these with a bit of watercress, dressed with a honey and grainy mustard dressing which went perfectly with the salty patties. This entry was posted in Blog, Main meals, Snacks and tagged carrot, cheese, cooking, diet, dinner, easy, food, Gordon Ramsay, healthy, home cooking, light, meal, quick, recipe, salad, vegetable, vegetarian. Bookmark the permalink.